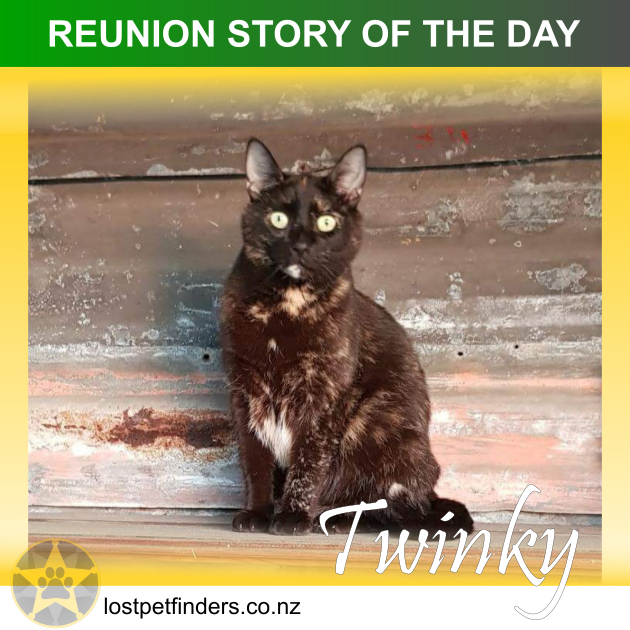 "Twinky was my first cat brought for my daughter on her 2nd birthday, 5 years on we have recently moved to a rural property and as much as twinky loved the new property she was not over joyed with yet another fur baby addition to the family (this makes 4 cats!) But the new baby was abandoned and nursed back to health so she stayed. A few busy weekends of guests in addition to the new house and new kitten must have all gotten too much and twinky disappeared. We searched the roads as we live on a main highway we thought the worst but no sign. We called every vet. We visited the Wanganui SPCA . We advertised on every lost pet site and all the social media. I urged our new community to share my posts incase a neighbour spotted her near by. Still nothing. The weeks started to go by without any sign or word of a sighting. I was confused by not knowing where she was and my child and other pets were unsettled. My thoughts were that the worst had happened and I'd never find her or know how it happened. ...on Easter Sunday about 10pm while watching a movie in bed, I hear the catflap which isn't unusual with 3 other cats still coming and going. But when I saw who slipped past in the lamp light heading straight for the food I couldn't believe it. I shook my partner awake and said twinky is home! I think he thought I had lost it. I jumped out of bed and sat on the floor watching her eating greedily like this was her first meal in quite some time. She was skittish and growling at the other cats that all gathered to greet her too. Apart from being a bit slimmer and very hungry she is totally unharmed and well and found her own way back home from whatever her adventure was. I'm unsure if she was away by choice or prevented from returning somehow but we are so happy she returned. We got a happy ending when we thought we would never have answers. For the time being twinky is being pampered by my 7yr old and keep safe in her room with bottomless food and all the comfort and cuddles to encourage her not to wander again.